May brings devotees of the Virgin Mary to sites of Marian fervor around the world. In Venezuela, as usual, many will flock to the country’s Caribbean beaches on weekends in May, while others make pilgrimages to its religious sites. One of the most important sites is Betania outside Caracas. The site inspires profound faith in its followers, who come seeking peace and prosperity, or return to offer their gratitude for petitions granted. The Virgin of Betania’s messenger, the late Maria Esperanza De Bianchini, seems destined for sainthood. Maria Esperanza, as she is popularly known, purportedly saw the Virgin for the first time in 1976 at her family’s Betania estate, which now draws throngs of devotees with a fondness for the mystical. Maria Esperanza claimed to have seen things from a very young age. As an adult, she purportedly received a vision from Saint John Bosco about her life’s mission, which would pave the way for everything that came after. That vision told Maria Esperanza that in four years she would meet her husband, and that he would be carrying a sword. Maria Esperanza met her husband Geo Bianchini on the streets of Rome, thinking that the young man might be the one. 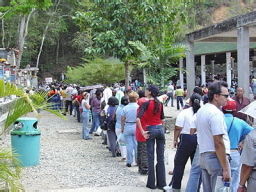 But Maria Esperanza fell ill after returning to Venezuela. She wrote Bianchini to say the wedding was off, although they’d barely dated. But three months after the letter, Maria Esperanza purportedly received a message telling her to find Bianchini. Back in Italy, Maria Esperanza brought a nun to their date for leverage. On that trip, Maria Esperanza saw Bianchini, who provided security for Cardinals, in a church carrying a sword as his job required. The Bianchini family today includes six daughters, all named María, and a son, plus 20 grandchildren. To many, they represent a model family. Growing up as Maria Esperanza’s children meant a rather unusual childhood. But as they tell it, growing up with a mother who claimed to see the Virgin was no big deal. The Bianchini family specifically bought the Betania estate because of a vision Maria Esperanza purportedly received. The fulfillment of that vision came on March 25, 1976 when Maria Esperanza claimed to have seen the Virgin in a grotto by a tiny stream at the foot of a small hill. But the Virgin of Betania took off after 1984 when over a hundred people claim to have seen her on the anniversary of her apparition. Children started yelling that they’d seen the Virgin, drawing the rest of the worshippers to the grotto. In a span of three and a half hours, the Virgin appeared seven times, according to the devout who were at Betania that day. “I thought it was the sun shining on a plant,” said Maria Esperanza Bianchini, her mother’s namesake and the eldest Maria, expressing her initial skepticism. She claims she saw “a thousand stars on her dress” and smelled roses, the perfume of Heaven’s garden, the Virgin purportedly told her mother. As common as the supernatural might have been for the Bianchini children, seeing an apparition for the first time was a life-altering experience. “You feel at home,” said Maria Auxiliadora. “You feel understood, not judged.” But apparitions also inspire guilt and shame. “You feel unworthy of that love. You want to cry and ask forgiveness,” added Maria Auxiliadora. “The question of why you were chosen that day follows you for the rest of your life,” according to Liscano. “You spend your life creating the response to that question.” The experience of seeing an apparition also erases doubts and strengthens faith, he adds. Yet the impact of seeing an apparition isn’t the be all and end all. What one feels is just as important. 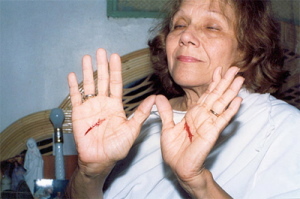 “It’s not the supernatural acts themselves” but the “sensation of a greater power” that marks you, according to Maria Auxiliadora. In the aftermath of the 1984 apparition, Monsignor Pio Bello, Bishop of the Diocese of Los Teques, investigated the apparition, finally giving it his seal of approval in 1987. 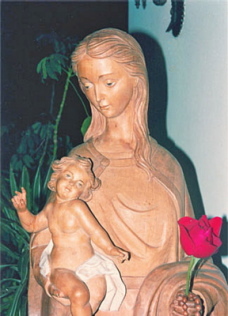 Although the official recognition must have boosted the Virgin of Betania’s following, the faithful fuel their devotion to the mystical with or without legitimacy. Maria Esperanza likewise followed a greater calling than any worldly authority, and as befits the Virgin’s messenger, seems destined for sainthood. According to her daughter Maria Esperanza, the Bianchini family is slowly beginning the process to prove sainthood. “We are collecting information and preparing ourselves,” she said. The purported apparitions might get all the attention, but there are plenty of minor miracles that count in the beatification process. In her liftime, Maria Esperanza purportedly “gave birth” to 15 roses. Ana Lugo, one of about 100 members of the Betania Civil Association, a community of devotees, claims to have witnessed one such birth. After a long day at Betania in which praying had kept them from eating or drinking much water, Lugo saw Maria Esperanza turn suddenly pale. 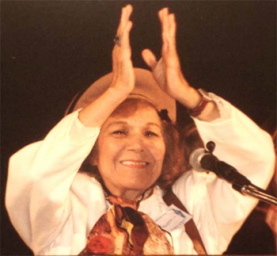 Around 1990, Maria Esperanza was giving the blessing at the end of a Betania mass as was her custom when, according to Carolina Fuemayor, another community devotee and its unofficial public relations liaison, Maria Esperanza levitated off the ground. “We’ve got that on video,” she said. As she performed the blessing, Maria Esperanza apparently experienced a transfiguration, becoming possessed by Jesus Christ, who in effect gave the blessing. The Virgin of Betania and her messenger have developed a large following locally, and have been making believers out of people around the world, particularly in the U.S. from which 77 devotees made the pilgrimage during Holy Week this year. When Maria Esperanza fell ill while in New Jersey on an evangelization trip last year, Foley went to see her. That’s when his relationship with Maria Esperanza, the daughter, started. The messenger had purportedly received a vision, which indicated that her eldest daughter would fall in love with a man who owned a beige car just as Foley did. Before she died, Maria Esperanza blessed their relationship. Foley works as Maintenance Director at Betania 2, the second of what Maria Esperanza envisioned as 12 Betania religious centers around the world. According to Foley, Maria Esperanza dug up a rock with Jesus Christ’s visage where Betania 2’s Spiritual Life Center now stands. Like other Betania devotees, Foley seems to think that Venezuela is the promised land. Proof appears to come in the postponement of his wedding, which he attributes to God’s plans. Although he gets a little frustrated, Foley figures that’s the way it has to be. “In God’s world, it’s not that way,” he said, referring to his American sense of time and scheduling. Asked if the issue isn’t cultural rather than spiritual, Foley shrugs off the suggestion. Everyone who comes to Betania to worship its Virgin considers the estate hallowed ground. But there are those who go so far as to think that Betania is the site of a “New Jerusalem,” or a “New Eden.” Wendy Benedict, a former travel agency owner and operator from Kansas City, is one of them. Benedict started coming to Betania about 15 years ago. A fervent Catholic, she was curious about what went on there. The Virgin appeared during Benedict’s first visit, she claims. That’s what started Benedict’s relationship with Maria Esperanza and Betania. 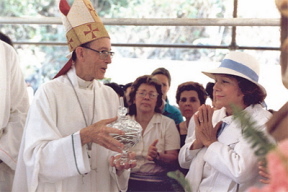 For ten years, Benedict’s devotion brought her to Venezuela once every two months. Many other American pilgrims seem to share Benedict’s yearning for family values and a Heaven on Earth. When told that poor Venezuelan families often lack a stable father figure, the pilgrims express surprise. Probably because of Maria Esperanza’s teachings, Fuenmayor says that people around the world will one day seek refuge in Venezuela. She too believes in Betania as the New Eden. Otty Ossa Ariztizabal, the Los Teques priest that conducts mass at Betania, calls it “a very beautiful center of Marian fervor, one of the most important in the world.” But he stops short of promoting the site as a Holy Land. “I don’t believe in that,” he said, expressing typical clerical skepticism. Carolina Santiago has been coming to Betania since she was a girl, mostly for the tiny stream’s holy water. Jesús Hernandez comes to ask for help, or express his gratitude for a petition granted, on issues of health, family, and employment. Some swear by the Virgin more deeply than others, but all believe in her powers to help and heal. The devout have placed a multitude of plaques on the Betania walls. The standard plaque reads: “Thank You Virgin of Betania for the Petition Granted.” A group of tin plaques suggests the poverty of some devotees. Others have made their own plaques, on the fly it would seem. One plaque consists of thick cardboard with the following message scrawled on a mirror: “Virgin of Betania: I petition you for help with my needs.” Instead of thanking the Virgin, this one asks for a favor. On these walls, one finds photographs of cars for which the devotee presumably gives thanks. One also comes across what look like xeroxes of diplomas, the devotees expressing thanks for help in graduating against all odds. Next to the chapel, and behind a simple chainlink fence, stands the Virgin of Betania in her grotto. Flower offerings crowd before her as her followers gaze in wonder outside. As is common at religious temples, Betania has an air of peace and joy about it. Some American pilgrims think that the Catholic Church in the U.S neglects its members’ mystical needs. For them, one of the American Church’s main problems comes in this gap between clergy and laity. While this perception festers, Marian worship flourishes.